Christian Doppler is one of the many scientists, whose discoveries had a tremendous impact on mankind - a long time after he died. The Salzburgian physicist discovered in 1842 a shift in the frequency of waves if source and receptor changed their position to each other. In other words: if a car blows its horn and is driving towards you, you will perceive the sound higher than it actually is; once the car passes you and now drives away from you, it will sound lower than it is - just think of the vrrrrrrrrooooommmmmm of a car driving by on the motorway. The so-called "Doppler effect" is the principle for velocity measurements and a number of other applications, including radar technology, distance estimates in astrophysics or automatic doors. 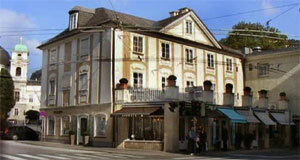 Christian Doppler was born in Salzburg, just next to the Tanzmeisterhaus (Mozart′s living place) on the Makartplatz 1. The house today hosts a Doppler research- and memorial society. For a long time, Christian Doppler was almost forgotten in his hometown. However, he was re-discovered in the last couple of years and the policy of sacrificing the scientist to the music-image of Salzburg was luckily abandoned. Today, a hospital, a square and a bridge in Salzburg were named after him and a plate on the façade of his birthplace commemorates Doppler. Most importantly though, the chocolatier Fürst, the inventor of the Mozartkugel, named a sweet after him - the "Doppler Konfekt". If you want to learn more about Christian Doppler, there is an exhibition on his discovery in the Haus der Natur natural history museum.